Man, oh, man! Where do the days go? They just fly by anymore. I haven't had time to keep my blog updated this past week, so I thought I'd share a few projects I've made but didn't get uploaded starting with the most recent and working back to last Friday. Tuesday of this week, was Mothermark's Teapot Tuesday and she showcased the cutest crossword puzzle teapot. I had purchased this birdhouse at one of my local hobby stores quite some time ago and decided it would be perfect for altering for this challenge! After I painted it with white acrylic paint, I covered it with designer siding using a crossword puzzle I copied out of my local newspaper. I used SU's largest oval punch and Cuttlebug embossing folder to create my rooftop. The little flowers and "for you" sentiment are SU rub-ons. The bird is a QuickKutz die. 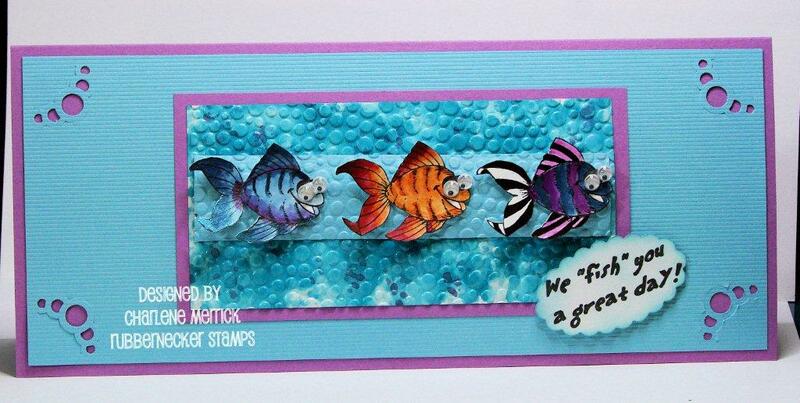 On Sunday, my friend Cathy (aka Mutnik) and fellow Rubbernecker DT member, was chosen as the Featured Stamper on SCS! Here's the cute I Smell Chocolate card of Cathy's that I cased, obviously changing mine to cows in Cathy's honor of her love of cows. She is one mega-talented artist! 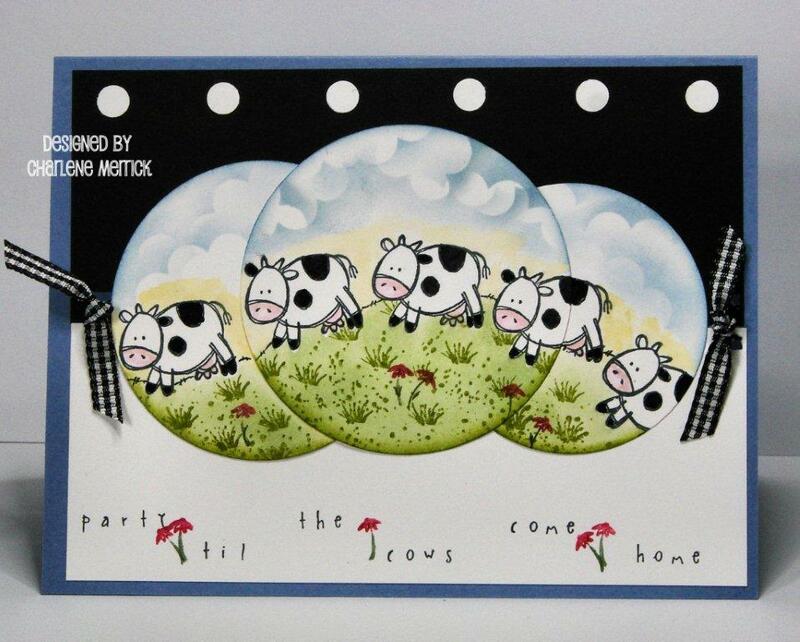 The cows are SU's Very Punny, and my grass and flowers were created with my Kittie Kits Cause a Scene by Rubbernecker. MarilynPrestonn was Queen for the Day on SCS. 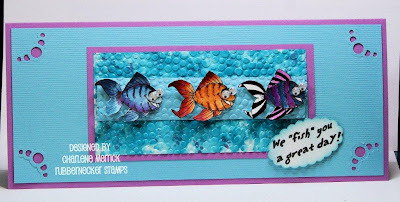 I cased her adorable bee card changing mine to these hilarious fishies by Rubbernecker. I colored them with my Twinkling H20s and gave them googlie eyes. For those of you who know me, and Sheri (ksnurse) obviously does, you know I love penguins! I just think they are such cute little creatures and just watching them walk their goofy walk makes me giggle. 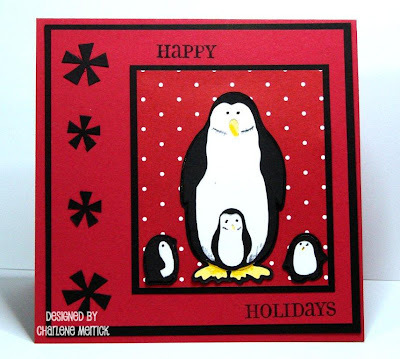 Sheri sent me these darling penguins she created with her Cricut for my birthday this year. Stef, over at SCS, had us go to the cutestfood.com website for the Inspiration Challenge on Saturday and I chose the penguin egg for my inspiration piece. Don't forget that today is the last day of the sale going on over at Rubbernecker (see my post below). You have until midnight (EST) to place your order! That's it for now as I'm off to a hair appointment, a little shopping, and then plan to stamp this evening! I hope you'll stop by tomorrow when I'll have my weekly CCEE challenge card posted! Don't tell me it's already time for another CCEE challenge. You're right, the days are just zipping past. But I'm glad you shared this catch-up post, as I have to admit I didn't even try to catch up on everything I missed while we were away. Party till the cows come home - that's so much fun!! Love the little scenes against the blue and white background. I think I caught most of these so cute creations on SCS, except for the penguin which is adorable!! Well, we got dumped a huge amount of snow last night here...is it spring yet really?? Take care Charlene...when you get a chance to look, I put up some new to me shelves in my stamp room over the weekend and have a couple of your creations on them...:)Just didn't want you to miss it. Yeah, I hear ya, things have been busier here too. 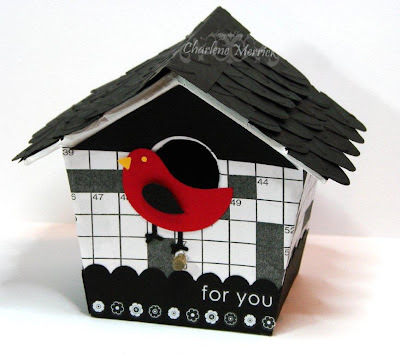 Love that birdhouse...so creative and beautifully done. Love the cow card with all those gorgeous clouds and the grass you added in. YOu have been busy.... stamping girlie! The little fishies are totally cute. I like the bird box very creative! They are all wonderful. I have no idea where the days go anymore. Life is a blur, but you've sure been making the most of it. It's great to see all these wonderful creations! Charlene, you have been a busy bee! I LOVE the birdhouse! What a creative, fantastic, fun take on Cindy's challenge! All the rest of your creations in this post are outstanding. Your mojo is in high gear, girl! Have a super fantastic weekend! !